The Srimad Bhagavatam is generally mistaken to be the same as the Bhagavad-gita. The Bhagavad gita , which was spoken by Lord Krishna on the battlefield of Kurukshetra, is the most famous book in the entire universe because it is spoken by God Himself. One may go to any part of the world and one will find that everywhere the glories of the book are sung. Any serious seeker of the Absolute Truth will not be unaware of the exalted nature of the divine book. Since the Bhagavad gita was spoken on the battlefield to induce Arjuna to fight, it is concise in nature and many higher transcendental exchanges of love are not discussed. These topics are discussed in detail in the Srimad Bhagavatam, which is considered the graduate study of the Bhagavad-gita. The Srimad Bhagavatam is one of the eighteen puranas, and is therefore, also known as the Bhagavata Purana. It is considered to be the essence of all the Vedas. The Vedas are compared to a desire tree because all kinds of knowledge that one may desire, are available in them. But Srimad Bhagavatam is the ripened fruit of that desire tree because it is giving the highest knowledge of the Supreme Personality of Godhead and the reciprocation of loving exchanges between Him and His devotees. It was spoken by Sukadeva Goswami, the son of Vyasadeva – the compiler of all the Vedic literature, to King Parikshit on the banks of the Ganges, when the latter was cursed to die after seven days. It is composed of eighteen thousand verses divided into 12 cantos. The Bhagavad gita, which consists of 700 verses, is considered the essence of all the Upanishads. These two books, namely the Bhagavad gita and the Bhagavatam are enough to gain a complete insight of the Supreme Absolute Truth. Just as the Ganga is considered the best among the rivers, Krishna – the most exalted among all deities and Lord Shiva as the best among the devotees of Krishna, similarly the Bhagavatam is considered the best among all the Puranas. It is the natural commentary of the Vedanta Sutra since it is written by the author, Vyasadeva himself. His Divine Grace A.C. Bhaktivedanta Swami Prabhupada, the founder acharya of the International Society for Krishna Consciousness, has done a great service by making the great epic available in the English language. The English translation with roman transliteration, word-to-word meanings and commentary is available in eighteen volumes at all the Hare Krishna Centers around the globe. The Bhagavatam starts with a prayer to Lord Krishna, the son of Vasudeva because it is conclusively proved in it that Krishna is the original Personality of Godhead (krsnas to bhagavan svayam). The mayavadis are very afraid of the great epic because they cannot twist and interpret it to prove that God is impersonal. It is clearly stated at every step of the Bhagavatam that God has a Personality and Krishna is that attractive Personality of Godhead, who is original source of everything in the entire creation. It concludes by proclaiming that the highest form of religion in the present age of Kali is to chant the holy name of Krishna, because by doing so, one gets liberation from the miseries of the material world, namely birth, old age, disease and death. One can attain the highest benefit of love of Godhead by chanting the holy name Hare Krishna Hare Krishna Krishna Krishna Hare Hare/ Hare Rama Hare Rama Rama Rama Hare Hare. It is wonderfull experience to hear prabhupad. A pure….unconditional love ……to God. Some genuinely nice and utilitarian information on this website, too I believe the design holds great features. I am moving to fort collins. I am seeking a hare krishna temple or study group of devotees. We never say that Krishna came from Godhead. Krishna is Godhead Himself. Can you please pin-point the exact location where it is mentioned that Krishna came from Godhead. You won’t find it on our website – you must have read it on some unscrupulous site. Krishna is the original personality of Godhead. He is the source of all living entities. If you are trying to learn about Krishna consciousness you should first read the “Science of Self Realization” and “Journey of Self Discovery”. These books are a compilation of the lectures, letters and conversations of His Divine Grace A. C. Bhaktivedanta Swami Prabhupāda. Then you should read the Krishna book and also simultaneously read the Bhagavad Gita As It Is. Then take up the Srimad Bhagavatam. Srila Prabhupāda extensively quotes from the Bhagavad Gita and Bhagavatam. Wherever any verse is quoted, you can refer the verse from the Bhagavatam or the Bhagavad Gita, as the case may be. While reading the “Science of Self Realization” and “Journey of Self Discovery”, I suggest that you simultaneously read the second chapter of the Bhagavad Gita because this chapter explains about the spirit soul. Without understanding the spirit soul, i.e. 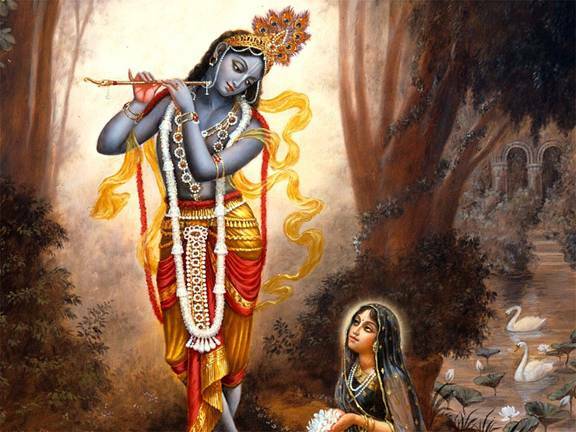 “who you are”, you cannot factually understand Krishna, or God. Or you can buy hard copies from your nearest Hare Krishna Center. And keep reading our blogs and keep asking questions if you have any doubts. And don’t forget to chant Hare Krishna. If you keep chanting Hare Krishna, all the transcendental knowledge contained in the Bhagavad Gita and the Srimad Bhagavatam will automatically be revealed in your heart. svayam eva sphuraty adah. Would you suggest reading Bhagavad Gita As It Is first? Or reading Srimad Bhagavatam (I only have the first canto for now)? You may read both side by side. Generally, as a rule, it is advised that one should read the Bhagavad Gita As It Is first and then read Bhagavatam. But there is no harm if you read both the books together. The commentary of His Divine Grace Srila Prabhupada to the First canto is comprehensive as His Divine Grace has touched upon the entire philosophy of the Gita and and all other Vedic literatures in it. It is very confusing to know that in Bhagwat puranam and in bhagvad geeta , it is said that lord krishna is the supreme god head but the shaivas claim that in shiv purana it is mentioned that lord shiva is the supreme godhead. Who is correct? There is no confusion. The Bhagavad Gita and the Bhagavatam are supreme authoritative books and they are always correct. The Bhagavad gita is the essence of all the Upanishads (sarvopanisado gavo) and the Bhagavatam is the best among all the puranas (purananam idam tatha). Thus the Bhagavatam is superior to all other puranas and therefore when the Bhagavatam states krishnas tu bhagavan svayam: that Krishna is the Supreme Personality of Godhead, we have to believe it as an axiomatic truth.